became a town in 1961 and grew as the capital of Bhutan. Before 1960, Thimphu was a small settlement but was developed by the King Jigme Dorje Wangchuk to replace the ancient capital of Punakha. The cilimate of Bhutan is affected by monsoons that bring between 60 and 90 percent of the region's rainfall. The climate is humid and subtropical in the southern plains and foothills, temperate in the inner Himalayan valleys of the southern and central regions, and cold in the north, with year-round snow on the main Himalayan summits. Temperatures vary according to elevation. Temperatures in Thimphu, located at 2,200 meters above sea level in west-central Bhutan, range from approximately 15ｰ C to 26ｰ C during the monsoon season of June through September but drop to between about -4ｰ C and 16ｰ C in January. Most of the central portion of the country experiences a cool, temperate climate yearround . In the south, a hot, humid climate helps maintain a fairly even temperature range of between 15ｰ C and 30ｰ C year-round, although temperatures sometimes reach 40ｰ C in the valleys during the summer. Annual precipitation ranges widely in various parts of the country. In the severe climate of the north, there is only about forty millimeters of annual precipitation-- primarily snow. In the temperate central regions, a yearly average of around 1,000 millimeters is more common, and 7,800 millimeters per year has been registered at some locations in the humid, subtropical south, ensuring the thick tropical forest, or savanna. Thimphu experiences dry winter months (December through February) and almost no precipitation until March, when rainfall averages 20 millimeters a month and increases steadily thereafter to a high of 220 millimeters in August for a total annual rainfall of nearly 650 millimeters. Bhutan's generally dry spring starts in early March and lasts until mid-April. Summer weather commences in mid-April with occasional showers and continues through the premonsoon rains of late June. The summer monsoon lasts from late June through late September with heavy rains from the southwest. The monsoon weather, blocked from its northward progress by the Himalayas, brings heavy rains, high humidity, flash floods and landslides, and numerous misty, overcast days. From late November until March, winter sets in, with frost throughout much of the country and snowfall common above elevations of 3,000 meters.
. WKD : Festivals of Bhutan . The NLB also has an impressive Collection of about 4.000 English Books. Tandin has been guiding folks for over 13 years and has an intimate knowledge of the land and its culture. One said: "The flag moves." The other said: "The wind moves." They argued back and forth but could not agree. Hui-neng, the Sixth Patriarch, said: "Gentlemen! It is not the flag that moves. It is not the wind that moves. It is your mind that moves." - Festival Dates Published by Bhutan Tourism Bureau. - All festival dates are calculated according to the Tibetan/Buddhist lunar calendar and are subject to change without notice by the local authorities. like the Bhutanese New Year and other seasonal festivals like the summer solstice etc. But the most common festival is known as Tshechu. It is in fact a religious festival, and is celebrated all over Bhutan, usually after the end of the harvest season. The Thimphu Tshechu in the capital of Bhutan is held in mid September. The main highlight of the Tshechu is the performance of the masked dances by the monks. There are many kinds of maksed dances all involving different moves, masks and costumes. All of them special religious significances. According to legend, all these dances appeared in the past Buddhist master's vision during their meditation. The steps and moves are strictly followed as it was performed in the past. Alteration of the steps is seen as sacrilegious and would not be attempted by any masked dance teacher. celebrates the life of Guru Padmashambhava also known as Guru Rimpoche. It is based on his hagiography which recounts that on the 10th day of the lunar month important events of his life occured. But the Tsechu is not an every 10th day of the lunar month event. It is a seasonal event and different valleys have either a spring, autumn or winter Tsechu. are annual religious Bhutanese festivals held in each district or dzongkhag of Bhutan on the tenth day of a month of the lunar Tibetan calendar. The month depends on the place, but usually is around the time of October. Tsechus are religious festivals of Drukpa Buddhism. The Thimphu tsechu and tha Paro tsechu are among the biggest of the tsechus in terms of participation and audience. Tsechus are large social gatherings, which perform the function of social bonding among people of remote and spread-out villages. Large markets also congregate at the fair locations, leading to brisk commerce. The focal point of the tsechus are the sacred Cham Dances, which are banned in neighbouring Tibet.These costumed, masked dances typically are moral vignettes, or based on incidents from the life of the 9th century Nyingmapa teacher Padmasambhava and other saints. Most tshechus also feature the unfurling of a thongdrel (or thangka) - a large tapestry typically depicting a seated Guru Rinpoche surrounded by holy beings, the mere viewing of which is said to cleanse the viewer of sin. The thongdrel is unrolled before dawn and rolled up by morning. Padmasambhava, the great Nyingmapa scholar, visited Tibet and Bhutan in the 8th century and 9th century. He used to convert opponents of Buddhism by performing rites, reciting mantras and finally performing a dance of subjugation to conquer local spirits and gods. He visited Bhutan to aid the dying king Sindhu Raja. Padmasambhava performed a series of such dances in the Bumthang valley to restore the health of the king. The grateful king helped spread Buddhism in Bhutan. Padmasambhava organized the first tsechu in Bumthang, where the eight manifestations of Guru Rinpoche (Padmasambhava being the human form) were presented through eight forms of dances. These became the Chams depicting the glory of Padmasambhava. Paro Festival Tour is one of the crowded and popular festivals in Bhutan with its unique unfurling of the world’s biggest Thangka or Thongdrol ceremony. The pageantry is a unique experience and quite unlike anything you have ever seen before. The unfolding of the silk Thangka - which is so large that it covers the face of the building -is considered one of the most sacred blessings in the whole of Bhutan. The 'Thangka' is a religious picture scroll known as a Thongdroel and it is exhibited for a few hours, at day break of the final day of the festival, enabling the people to obtain its blessing. This holy scroll 'confers liberation by the mere sight of it' (the meaning of the word 'thongdroel' in Bhutanese). This festival is held once a year so it is also the time for Bhutanese to come dressed-up in their finest colorful costumes to socialize and make merry. This is not an event organized for tourist; it is an event that has been happening for centuries. You may get the attention of the Atchara(clown), Bhutan people won’t stare at you like elsewhere. Events inside Paro Rimpung Dzong commence with monks performing Shingje Yab yum, the dance of Death (Shingje) and his consort. This is followed by Durdag, the dance of the lords of the creation grounds, then Shanag, dance of the black hats, Drametse Ngadham, the dance of the druk from Dramtse, De Gye Mang Cham, the dance of the eight kinds of spirits and finally Chhoeshey,a religious song are also Zhungdra and Boedra dances performed by the Dzongkhag’s dancers. Padma Sambhava, Nagarjuna, Milarepa . . .
in Tsechu masks of gods . . .
. Festivals of Bhutan . Bhutan’s national flower – the Rhododendron. These “tree” rhododendrons are forest dwellers that grow at high altitudes. They grow to large sizes, largely as a result of the abundant moisture available to them and will not flower for at least 20 years. Their optimum form is reached at around 50 years. From early March when the first rhododendrons begin to bloom in Bhutan, the amazing colours of R. barbatum, R. niveum and R. dalhousiae are quite stunning. Along with perhaps the best known of tree rhododendrons R. arboretum, the enormous R. grande and the delicate R. glaucophyllum, Bhutan Post has captured only six of the estimated 54 varieties of this species found in Bhutan. These six however are truly representative of this magnificent flowering plant and Bhutan Post is proud to highlight them in this stamp issue.
. . . CLICK here for Rhododendron Photos ! The pass is marked by 108 chortens (Stupa), the Druk Wangyal Khangzang Chhortens. It is about 30 km away from Thimphu, leading toward central Bhutan, Punakha and Wandgi. 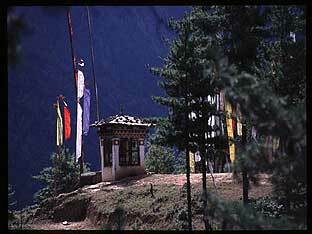 There are also many prayer flags on the pass. Prasoon Publishers, 168 Swapnil House, Housing Board Colony, Sec-7 Extn., Gurgaon 122001 (Haryana), India. 2010. 64 pp. ISBN: 978-93-81032-01-5. This is Aju Mukhopadhyay’s seventh book of poems in English and second of this variety of haiku, tanka and relevant essays. Very few poets can use pronouns and still leave the haiku open to the reader. how can the haggard welcome it? Other haiku read more as statements of fact and do not have the kigo (season word), nor kiriji (cutting word) necessary for a good haiku. We cross them to live. In these tanka, Mukhopadhyay demonstrates control of his material, mood, subject matter and situation, and perfect modulation of tone. He inhabits the world clearly and cleanly, engaging in traditional and modern dimensions with equal ease. In these essays, Mukhopadhyay writes of his creative ideas, the place of the Japanese short forms of poetry in the modern world, the introduction of tanka to India by Rabindranath Tagore and recent trends in writing haiku. Nestling in the eastern Himalaya, the kingdom of Bhutan is a land locked country with an approximate area of 47000 square kilometers. Its unique location along with altitude and climatic variations attribute to the tremendous diversity of flora/fauna to be found within its boundaries. Within its physical and biological diversities and with over 70% forest cover, Bhutan has some of the best remaining representative samples of the unique Himalayan eco- system. The vegetation varies dramatically over short distance, ranging from tropical broadleaf to temperate conifer forests, to alpine shrubs and meadows. 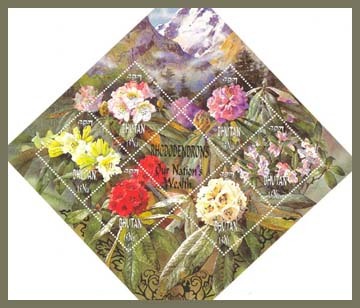 In addition, a rich assortment of medicinal herbs dot all over the country as do over 600 species of rhododendron. These forests provide habitats for a variety of faunal species such as tigers, elephants, greater one horned rhinoceros, golden langur, blue sheep, musk deer, wolves, leopards, takins and a host of other creatures, many of which are listed as threatened or endangered. This year these birds which migrate to the Tibetan plateau for nesting have delayed their flight. This haiku is for April 2010. Black necked Crane winter migration to Bhutan. How this majestic bird “THRUNG THRUNG KARM’” to descend from the lofty Tibetan plateau and spend their winter in Bhutan.